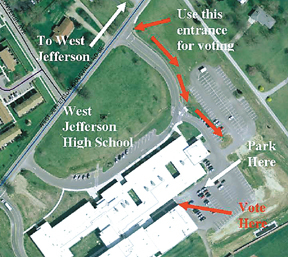 West Jefferson High School is the new polling location for all voters in West Jefferson (precincts 1, 2, 3 and 4) and Jefferson Township (precincts 1, 2 and 3). 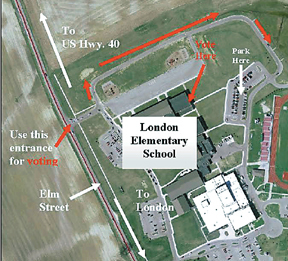 London Elementary School is the new polling location for voters in the 2-B, 3-A, 3-B, 4-A, 4-B and 4-C precincts in London. Jonathan Alder High School is the new polling location for voters in the Plain City East, Plain City West and Darby Township precincts. Several Madison County voters will go to new locations to cast their votes in the Nov. 6 general election. The Madison County Board of Elections has selected three school buildings as polling places. The changes were made, in part, to offer better parking and better accessibility for people with handicaps, said Matthew Tlachac, Board of Elections deputy director. Residents of West Jefferson and Jefferson Township previously voted at First Baptist Church of West Jefferson and American Legion Post 201. Now, everyone in West Jefferson and Jefferson Township will vote at West Jefferson High School. That includes precincts 1, 2, 3 and 4 in the village and precincts 1, 2 and 3 in the township. Principal Dave Metz said voters will access the high school through the event entrance on the old side of the school. They will enter directly into the high school gym lobby and vote in the gym. They will exit the same way they came in. As part of their government class, several high school seniors will greet voters and help the poll workers. Middle school faculty members will use the auxiliary parking lot, freeing up the back parking lot for voters. Metz said the busiest time of day will be the middle of the afternoon when parents use the same side of the building to pick up their children from school. In London, voters in precincts 2-B, 3-A, 3-B, 4-A, 4-B and 4-C will no longer vote at the Knights of Columbus Hall or the Madison County Senior Center. Instead, they will vote at London Elementary School. 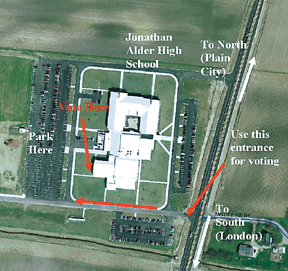 Voting traffic will be directed to the second entrance to the school complex, the one closest to the elementary school. Daniels has sent information home to students’ families explaining the plan for Election Day. She anticipates 3:15 p.m. being the busy time, when school ends, busses go out, and parents show up to pick up their children. Residents in the Plain City East, Plain City West and Darby Township precincts will no longer vote at the Plain City Library or the Veterans of Foreign Wars Post. Instead, they will vote at Jonathan Alder High School. “We have plenty of parking and are handicap accessible with the new building. It seemed like a good fit,” said Doug Carpenter, Jonathan Alder superintendent. The polls will be set up in the high school’s auxiliary gym, where an entrance and exit has been established. Rest rooms in the gym’s lobby will be convenient to voters and poll workers. High school students will serve as greeters and direct people to where they need to be. On Tuesday, polls throughout Madison County will be open from 6:30 a.m. to 7:30 p.m. Results will be updated throughout the evening online at http://www.co.madison.oh.us/15001/index.html and at the Madison County Courthouse in London. Final results will be posted at each polling place. Voters must show identification before casting ballots. Acceptable identification includes an Ohio driver’s license or state ID card. Also, a utility bill, bank statement, government check, payroll check, military ID, or other government document (not including documentation from the Board of Elections) is acceptable; all of these forms of ID must show the person’s correct name and current address. Anyone who recently moved into the county and is not sure where they should vote can cast provisional ballots at the Board of Elections Office, 117 W. High St., Suite 102, London. The same polling hours, 6:30 a.m. to 7:30 p.m., apply. For more information, call the Madison County Board of Elections at 740-852-9424.